Take to the streets of Liberty City and stomp out Rockstar's devs plus other fans in the GTA IV Social Club Multiplayer Event tomorrow, November 29th, from 4 to 7 PM Eastern Time US on all platforms. More details below. Five nifty prize packs will be given away on Thursday. Each one includes a Rockstar Machine Tee, GTAIV license plate, a bonus Max Payne 3 t-shirt and a bunch of stickers. All you need to do to enter is give Rockstar some information so they know (if you win) where to send the package. All the details stay with them. They do not give them out to anyone that's going to spam you with emails or whatever. Head in-game before things begin Thursday to prepare your multiplayer avatar's look. Gotta look sharp for the video streams on the Social Club multiplayer event page and Twitch. Be sure to hit up your friends ahead of time so you can get together in Party Mode to strategize for Team Deathmatch. Rallying points, places to avoid, body armor spots, etc. Take a few practice runs at the tracks in GTA Race so you're solid on the shortcuts and weapon pickups. Enter a few Deathmatch games to warm up on your shooting and aiming skills. Quick, efficient kills. And most importantly, be sure you've got the discs nearby and the games and patches installed. Game installation is optional on 360. Only add one of our devs to your friends list to play. They will clear each account's friend list at the start of the event and accept as many invites as they can. It is recommended to play with Social Club members, as getting in a game with a dev is not a guarantee but they will try their best. 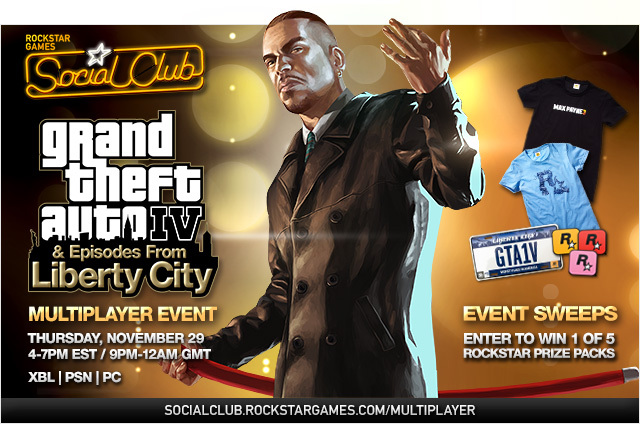 Pay attention to the live chat on the Social Club multiplayer event page. Rockstar will announce where they are at in the chat. They'll begin in Grand Theft Auto IV in GTA Race, and later progress to The Lost and Damned in the second hour and The Ballad of Gay Tony in the final hour. Use the in-game cellphone to select the mode they are playing during the event. For team-based modes such as Team Deathmatch, gather your friends using Party Mode. You can also hit up the chat during the event to post your PSN ID/Gamertag. See you there and join us at the Grand Theft Auto V forums!